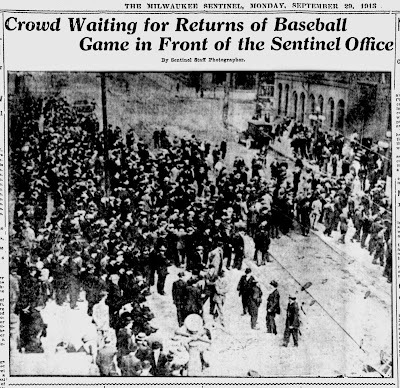 Borchert Field: This weekend in 1913 - "It's All Over but the Shouting, and That is Still Going On"
This weekend in 1913 - "It's All Over but the Shouting, and That is Still Going On"
Yesterday we saw how five thousand fans crowded in front of the Sentinel building in downtown Milwaukee to hear Brewer play-by-play related to them via wore (and megaphone). 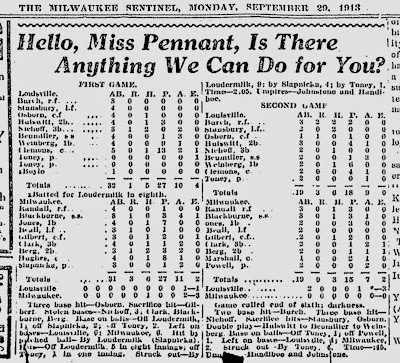 The Brewers were in Louisville with an opportunity to clinch their first American Association pennant. So how'd the Brews do? Remember, they needed to win at least one game from the Colonels and have the Minneapolis Millers lose one. 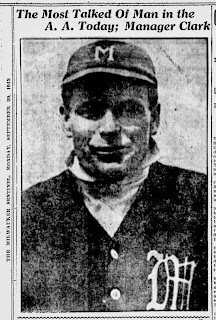 The Millers obliged, dropping the first game of their double-header in Columbus, 13-3, while the Brewers' first game was still in progress. Now it was up to third baseman/manager Harry "Pep" Clark and his boys. The Brewers opened the game showing some of the strain they had been under for months. 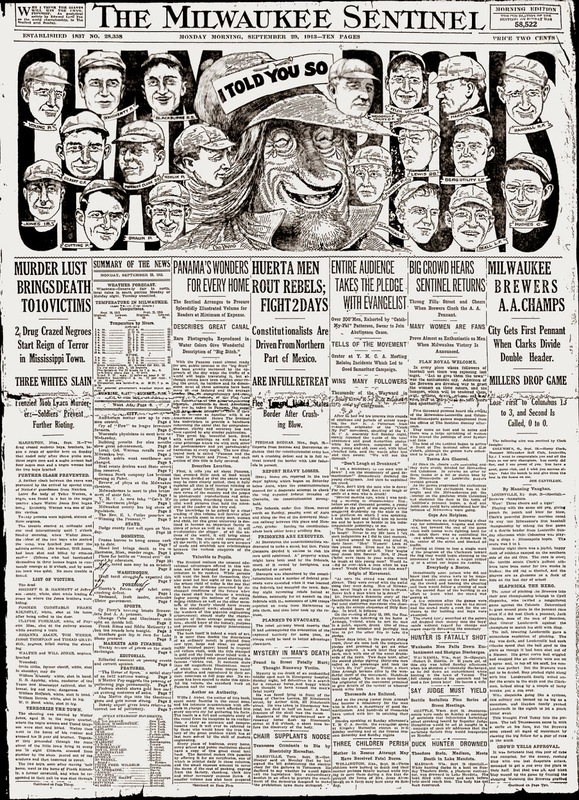 The Milwaukee Journal told its readers that "lines of anxiety marked every (player's) face and for a time it looked as though the team would break under the strain." The usually sure-handed shortstop Lena Blackbourne booted an easy grounder in the top of the first, allowing a Colonel to advance into scoring position. Fortunately Milwaukee had ace Cy Slapnicka on the mound, and he was able to pitch himself out of the jam with a well-timed strikeout. After that shaky start, the Brewers started to take over. Even the ball started bouncing their way; when a Louisville drive lined right off Slap's leg in the third, not only was the hurler unscathed but Pep Clark was able to snag the ricochet in time to nail the runner at first. The Brewers and Colonels remained scoreless through the first five frames. The "Clarksmen" were aggressive on the basepaths - they had three runners caught stealing in the first five innings - and the strategy finally paid off in the sixth for the game's first run. With two outs and nobody on, Blackbourne managed to draw a walk and then went to work. He stole second base on the next pitch and moved to third when the Louisville catcher's throw to second bounded into center field. Blackbourne stood 90 feet from a Brewer lead when first baseman Tom Jones strode to the plate. The "big Welshman" took a mighty swing at a pitch from Lousiville's Grover Loudermilk, but he got over the ball. His line drive went almost straight down, striking the turf just in front of the plate and bouncing high in the air. Jones was off running, and by the time Loudermilk could get a handle on the ball his throw to first was late. Blackbourne scored in the confusion, and the Brewers were on the board. They followed it up with two more runs in the top of the ninth. Even though the Colonels managed to plate a run in the bottom frame, it wasn't enough. 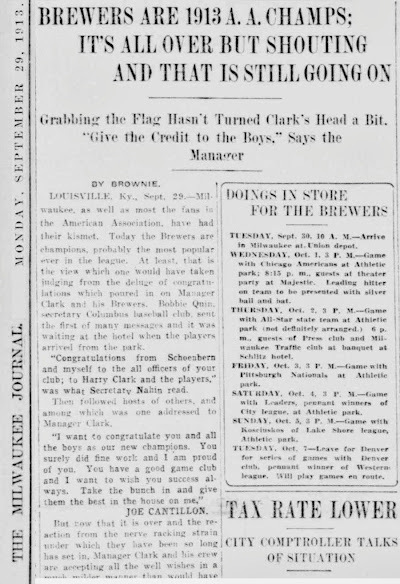 The Brewers had won their first pennant. 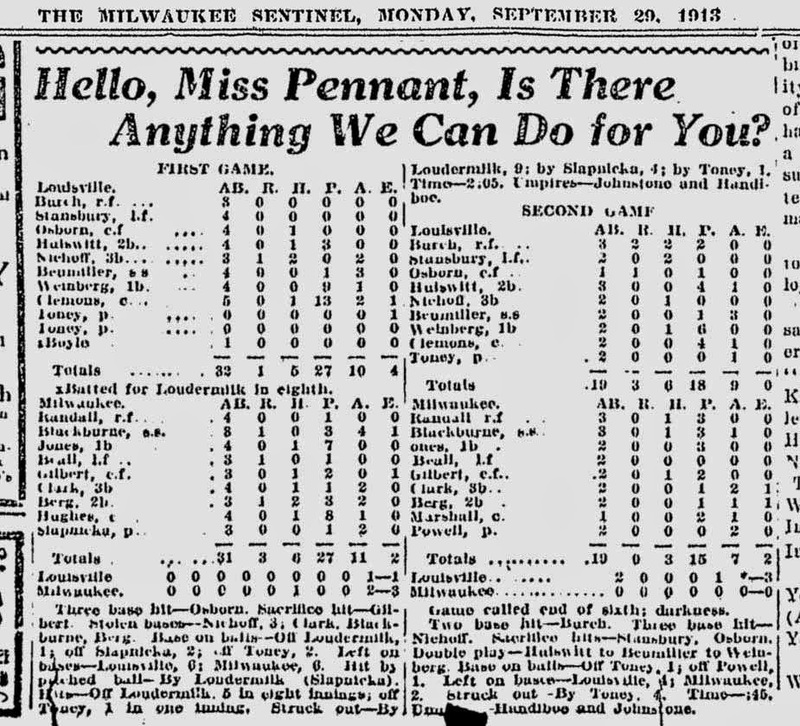 Milwaukee players sprinted out of the dugout and embraced on the field, yelling and waving to the small but noisy handful of Brewer fans who had made the four hundred-mile trip down from the Cream City. As they celebrated, Brewer backstop "Doc" Marshall yelled up to the press box "Tell 'em up in Milwaukee to get that pole!" The Kentucky fans were gracious in defeat, glad at least that their rivals in Minneapolis were denied the crown. The home fans gave the visitors a round of applause "in true southern style". There was another game to play, but the Brewers didn't seem all that interested in the second half of the day's double-header, and when the game was called on account of darkness after five½ innings the Colonels had taken it 3-0. Here are the box scores for the two games: No matter about that second game; the Brews had what they came for. It's a little busy, with the players' faces threatening to obscure the word "CHAMPIONS", but I think the paper could be excused its enthusiasm. The "Py Golly" character in the middle is an interesting one. He seems to have been cartoonist Cad Brand's own mascot for the club, a Scandanavian-accented booster who chronicled the team's story in the pages of the Sentinel. 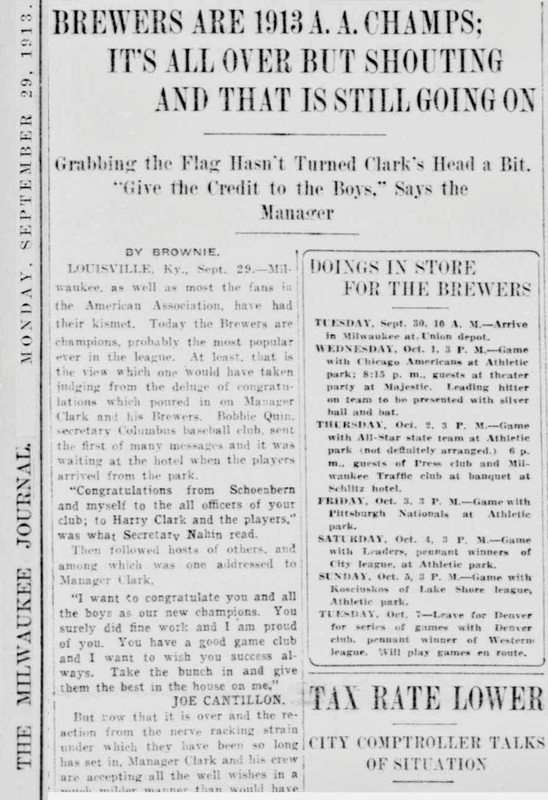 Much of the credit for the pennant was laid at the feet of Pep Clark. Although 1913 was his first campaign in the double player/manager role, he had been Milwaukee's third baseman since 1904 and was well-liked throughout the league. When he came up to bat for the first time in that darkness-shortened second game with Louisville, the home fans gave him a round of applause. Pep responded by tipping his cap, the gentleman. Pep and determination won the pennant. The boys certainly deserve all the credit in the world. They're the gamest bunch of fellows I ever played with. They never knew when they were beaten. When Minneapolis passed us two weeks ago not a man on the team lost hope. They battled all the harder, battled their way back into the lead and on Sunday nailed the flag to the pole. It was a tough fight and I am glad it is over. Now that we have the pennant I might as well confess that I have slept hardly a wink in the last week. After that 20 to 10 reverse in Indianapolis on Friday you could have cut the gloom with a cheeseknife. I was down in the mouth and so was the whole bunch. But we went back full of confidence on Saturday and we won. We all felt better after that, but were all on edge when we started that first game Sunday afternoon. It wore off as the game progressed and after we scored that run in the sixth inning I don't believe I ever felt happier or more confident in my life. It also put new life in the boys, they were in there to battle for every inch and they certainly came through in fine style. I had a good ball club all season. We had a lot of bad luck or I believe we would have had the flag clinched a week ago. My pitching was strong, the club was a hard hitting one, while in the field it played great ball. This combination and an iron bound fighting determination to fight all the way made for a championship club. Now for a pennant in 1914. Brave words from the Brewer skipper, but also an acknowledgment that the pressures of the season had been weighing on the club. 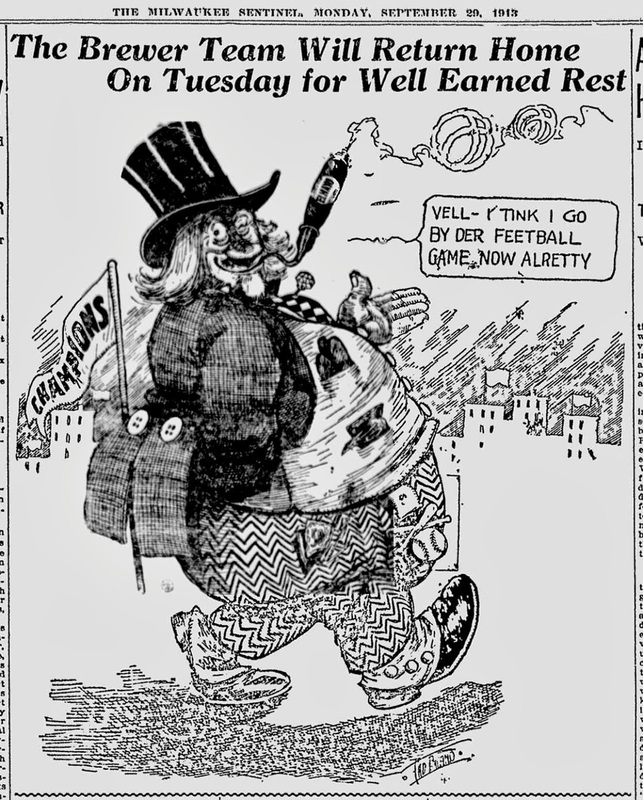 That evening, reporters found pitcher Joe Hovlik in the hotel lobby. Between puffs of his Havana, Hovlik echoed Clark's relief. Well, he told them, I'll get a decent night's sleep now, and believe me it will be the first one I have had in two weeks." The next day, the Brewers would finish the season with another twin-bill before heading back to Milwaukee and their fans. Banquets had already been planned, and a grateful city was eager to welcome back her heroes. 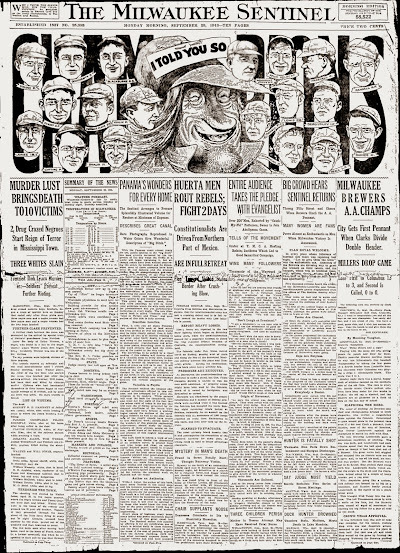 A post-season series was scheduled between the Brewers and the Denver Grizzlies, champions of the Western League, for bragging rights over all the minor leagues. But that was all to come. For now, it was time for celebration and sleep, although perhaps not in equal amounts. Milwaukee was a championship town.